The Locked e-pill MedTime PLUS Automatic Pill Dispenser is ideal for patients with complex medication regimens. Patients can dispense up to 24 doses per day with this device (see the filling chart below for more information). When it is time to take your medications, the device will alarm, prompting the patient to turn the device over. The pills fall out into their hand or a cup. This complete medication management system has no monthly fees. 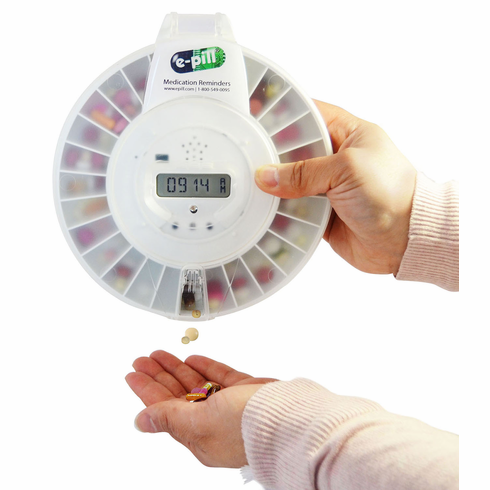 Help your loved ones avoid double-dosing with the e-pill MedTime PLUS Automatic Pill Dispenser. This improved automatic pill dispenser design is based on 15 years of customer experience and more than 50,000 automatic pill dispensers sold. The clear lid allows for the easy identification of pills by the caregiver. One can easily see when doses were missed and look for patterns in dispensing. A version of this pill dispenser with an opaque white lid is available HERE. Simple to Use for the Patient. Locked Pill Dispenser (2 keys are included). Patient is alerted with a Loud Alarm and Flashing Light. Auto-Lock Dispensing Door - access to the medication tray is enabled only at the scheduled dosage time. Dispenses up to 24 Times (doses) per Day. Long Alarm Duration that is user controllable (5 min - 5 hours). Patient Compliance Dashboard shows date, time, next dose scheduled, doses remaining, battery level. Easy Setup with prompted settings. Durable Swedish Design - Professional grade automatic pill dispenser Made In Sweden. Keeps your medications organized and make pill identification easy. How-It-Works: The alarm will sound & pills will rotate into position. Turn the dispenser upside down to allow the pills to fall into your hand or a cup. All other medicine is inaccessible. The alarm will stop when the device is turned upside-down, or after 5 hours (alarm duration is user controllable from 5 minutes to 300 Minutes). Set-Up & Load: Load the pills in the medication tray (two trays are included). Just set the alarm clock and the times you want the dispenser to alarm every day- that's it! Each compartment has a capacity equal to 18 Aspirins. For added capacity, you may set 2 or 3 alarms for the same time and double or triple the capacity. Capacity: Holds 18 Aspirin sized tablets per Dose. Max 24 Doses ('medication events') per Day. Battery life: 1 Year (4 x AA are included) with Low Battery Warning Indicator. e-pill Transparent Lid MD1 PLUS MedTime PLUS Automatic Pill Dispenser with Audible and Visual Alarm. Dispense up to 24 times per Day. Complete medication management system including 2 Medication Trays, Tray Dust Cover, 2 Keys, Batteries (4 x AA), Day/dosage Discs (3), Prescription Card and User Manual / SKU 992020 / UPC 837066000749 / Sold in Europe as Careousel Advance.